Nonfiction Picture Book Wednesday is hosted by Kid Lit Frenzy and was started to help promote the reading of nonfiction texts. Most Wednesdays, we will be participating and will review a nonfiction text (though it may not always be a picture book). 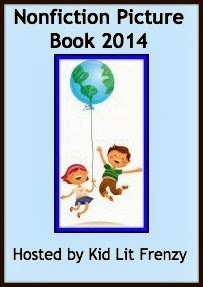 Be sure to visit Kid Lit Frenzy and see what other nonfiction books are shared this week! things she shouldn’t—but also isolates her from her classmates. She really just wants to fit in and find a true friend, someone who appreciates her as she is. After some trouble, she is finally able to harness the power of the Phonic Ear and become “El Deafo, Listener for All.” And more importantly, declare a place for herself in the world and fi nd the friend she’s longed for. Author: Cece Bell has written and illustrated several books for children, including the Geisel Honor book Rabbit & Robot: The Sleepover. She lives in Virginia with her husband, author Tom Angleberger. 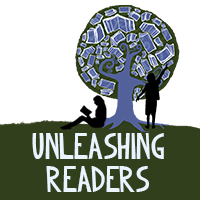 My Review: There are times that you read a book and when you are done, you just know that it is a special book. 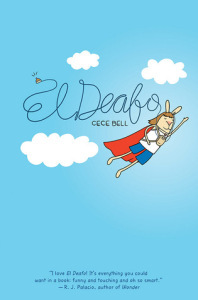 El Deafo is one of those books. 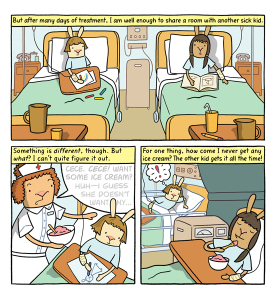 As you all know, I am a huge fan of Hurt Go Happy by Ginny Rorby, and one of the reasons I am is because it looks at disabilities in a positive light and shows that a disability is not an end, but just a change. 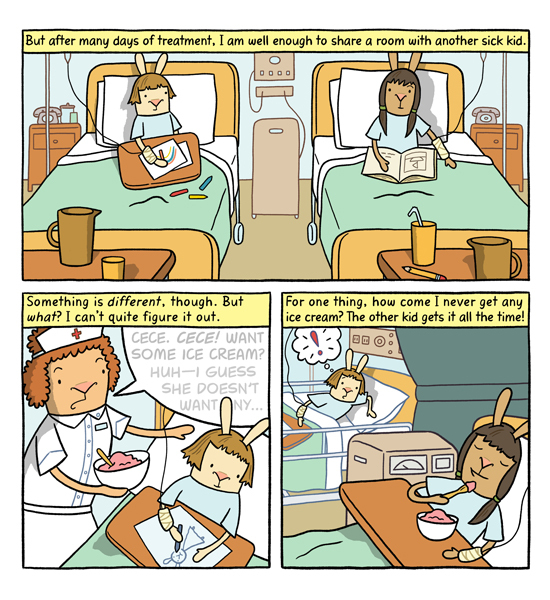 El Deafo is another novel that does this. Although Cece, like Joey in Hurt Go Happy, finds herself deaf at a young age, we see her overcome this blow and turn it into a superpower. But this book is about more than deafness; it is about being a kid, about growing up, about friendship, about ackwardness, about school, about crushes, about family, about life. This book is truth. Teachers’ Tools For Navigation: There is so much you can do with this graphic novel. Many activities can be found in the teaching guide that I wrote for Abrams. This book is perfect for independent reading, for lit circles with other graphic novel memoirs, for jigsawing, for read alouds, and for looking deeply into the text. hearing individuals throughout history and today. How did being deaf affect their lives? What were their accomplishments? I may finally end up reading this today just so I know what everyone is talking about! And, I like your other related titles! This is definitely one of my favorite graphic novels of the year and will probably end up on my favorite books of the year list. I can’t wait to share it in Children’s Lit next semester! There are so many ways to relate to this story–it’s such a specific, personal story and yet so universal. It will definitely be on my final lists as well. Your Children’s Lit students are going to eat this one up! And I agree. Although it is super specific, it also has something that everyone can connect with–growing up. Still need to get this, loved seeing your example. I know it will be good! Thanks Kellee! I book talked it to a HoH student as well; however, he had NO interest. He just wants to read Captain Underpants 😉 But one of his friends wanted to read it to understand him more. It was so sweet! I LOVED this book. Such a pleasant surprise. Can’t wait to see how students respond. Right now my daughter has made off with my copy. I agree this will be on many favourite lists in many categories. I love the book I am 11 years old and I I don’t like to read but I love the book and I read it 5 times.